Metal Bull Year I, by Chang Fee Ming at STPI. Watercolor, acrylic, etching, gold leaf, on STPI handmade paper. 77 x 62 cm. Art Radar remains devoted to sharing important and unique Asian arts institutions with readers, and few are as exciting as the Singapore Tyler Print Institute. Regular art fair goers may already be familiar with the institute, which is a fixture at many Asian art events. STPI is based (you guessed it) in Singapore, and stands alone in all of Asia as the only fully-equipped, artist’s printmaking and papermaking workshop. It was established in 2002 under the guidance of the American master printer Kenneth Tyler with support from the Singaporean government, and is a non-profit organization specializing in the publishing and dealing of fine art prints and remains dedicated to collaborating with extraordinary international artists. STPI boasts the foremost print and paper making facilities in the world for all the major printing techniques- lithography, intaglio, relief, and silkscreen printing, and continually attracts some of the most respected working artists to its studio. One of the more interesting aspects of this organization is its Visiting Artists Programme, which offers residencies to 6 exceptional international artists each year, lasting 4 to 6 weeks. During this time, artists live on the premises in fully furnished apartments and can freely experiment with different print and papermaking techniques while enjoying unbridled creative freedom. This dynamic environment has produced a wide range of works, including ‘paper pulp’ paintings, paper assemblage, and mixed media pieces. At the end of the residency, each visiting artist’s new works are curated and shown in a solo exhibition at the STPI gallery. STPI strives for diversity in its range of visiting artists, and has hosted artists from the United States, China, France, Malaysia, the Philippines, Indonesia, and Singapore. Renowned artists, including Donald Sultan, Ashley Bickerton, Zhu Wei, Atul Dodiya, Lin Tian Miao, and Chun Kwang Young have particpated in this Visiting Artists Programme. The STPI 4,000m2 facility is also extraordinary, featuring a modern printmaking workshop, a paper mill, an art gallery, an artist’s studio, and 2 fully furnished artists’ apartments. Many of the printing presses are customized to print on large format papers, and were designed and customized personally by Ken Tyler. STPI participates in special projects each year in addition to its main programming. The most notable of these ‘special projects’ was a rare collaboration of New York’s Asia Society and STPI in 2006 to celebrate the 50th anniversary of the Asia Society. The effort produced ‘Asian Contemporary Art in Print’, a limited edition portfolio of nine prints by respected Asian artists working in Asia, the United States, and Europe. This portfolio of works, curated by the Asia Society’s Museum Director and Curator Melissa Chui, was the first of its kind published by the Asia Society. Nilima Sheikh (India), Lin Tian Miao (China), Amanda Heng ( Singapore), Wong Hoy Cheong (Malaysia), Navin Rawanchaikul (Thailand), Wilson Shieh (Hong Kong), Michael Lin (Taiwan), Jiha Moon (Korea), Yuken Teruya (Japan), and Xu Bing (China). In addition to hosting international leading artists and publishing their artworks, the institute also enriches the Singaporean community with public art education programmes. Furthermore, the STPI curatorial team offers a collection management service for private art collectors, and will digitally archive a collection, provide reports on the value of the artworks, recommend how to best preserve the art, and source new works for a collection. The print studio and gallery are available for rent on a daily basis. Also, if a gallery or artist needs to publish a series of prints, this can be achieved by collaborating with STPI’s professional printmakers. Art Radar is pleased to see an innovative organization fostering creative dialogue with the international community, and suggests readers keep their eyes open, because you will likely see the Singapore Tyler Print Institute at Asian art fairs! Gallery Souflower, Bangkok’s only gallery exhibiting contemporary Indian art, in Silom Galleria is showing “The Ethics of Encounter: contemporary art from India and Thailand” until September 27 2008. The show is a juxtaposition of Thai and Indian art and showcases a variety of media and methods, from video and painting to performance. Artists include Ranbir Kaleka, Vidya Kamat, Manjunath Kamath, Sudsiri Pui-Ock, Navin Rawanchaikul, Pinaree Sanpitak, Rirkrit Tiravanija, and Chintan Upadhyay. Navin Rawanchaikul, a Thai artist who resides in Japan and has Hindu Punjabi origins has exhibited at many biennials and is known for his taxi themed projects such as Navin Gallery Bangkok Run from 1995 to 1998 in which the artist converted a taxi into an art gallery and invited artists from Thailand and around the world to exhibit. Vidya Kamyat, who has exhibited in a solo show in New York concerns herself with the human body and its veils proposing that there can be no pure unmediated relationship with the body. The UBS Art Collection embodies four decades of collecting, from the 1970s to the present day. Most of the works from the 1960s-1980s were assembled for an American investment company, PaineWebber, which was acquired by UBS in 2000. These works joined the artworks that UBS had been collecting for its sites across Europe to form what is today The UBS Art Collection. The Collection reflects the change in collecting from local to global, from a world in which most artists lived in the country where they were born and the art market was led by New York City, to a world in which artists migrate or divide their time between continents, and the art market has multiple centres across the globe. The Collection also reflects the change in visual arts practice from one that was prescribed by movements to one that is diverse and fluid. This exhibition of approximately 150 works demonstrates these changes. Beginning with a large group of Pop Art prints and drawings by artists including Jasper Johns, Roy Lichtenstein, Robert Rauschenberg, Andy Warhol and Edward Ruscha, the exhibition then presents a group of prints and drawings by Minimalist artists such as Ellsworth Kelly and Frank Stella. The 1970s ushered in a quieter conceptual aesthetic, represented in the exhibition by Vija Celmins and, although very different, Alighiero e Boetti. Here too is Chuck Close, who used a structure of grids and symbols in his multiple series of portraits. 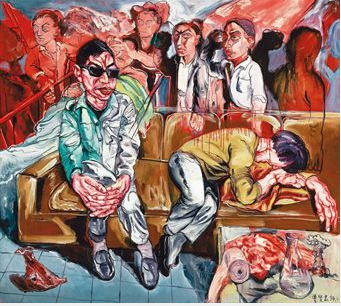 Then came the explosion of highly expressive figurate painting in the 1980s. Reacting against the performance-based and ephemeral conceptual practice of the 70s, these paintings and drawings often contained personal metaphors to reflect the lives of their makers. 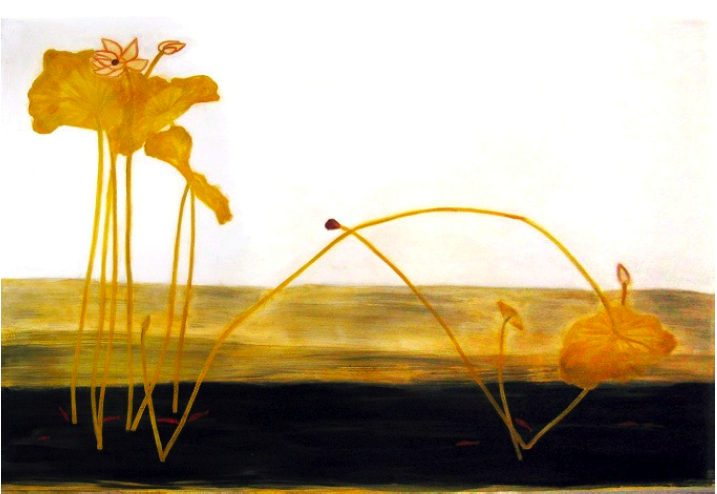 In Italy Sandra Chia, Francesco Clemente, Enzo Cucchi and Mimmo Paladino were grouped under the banner of Transavantguardia. In Germany Neo-Expressionists such as Georg Baselitz had an influence on the younger sculptor Stephan Balkenhol, included here, and painters such as Eric Fischl, Susan Rothenberg, David Salle and Julian Schnabel received wide acclaim in the United States. The British artist Lucian Freud had consistently focused on figurative painting since the 1940s, but didn’t receive international attention until the 1980s, the decade marked by this “return to painting’. He is represented in the exhibition by both paintings and prints. In the 1990s photography was a critical medium, used to record the physical world with apparent objectivity by artists such as Andreas Gursky, Thomas Ruff, Peter Fischli/David Weiss, Candida Höfer and Beat Streuli. The ’90s was also the decade of the much fêted ‘YBAs’, the group of young and savvy British artists represented here by Damien Hirst, Tracey Emin, Gary Hume and one of their mentors, Michael Craig-Martin. By 2000 thriving markets were by now established across the globe – from Mexico City to Mumbai, from Berlin to Shanghai. Biennials and triennials in Brisbane, Yokohama, Istanbul, Sarjah, São Paulo and Singapore, to name a few, had shifted and expanded loci of interest, and The UBS Art Collection now hopes to mirror this diversity and expand the possibilities for displaying art in its corporate environment with the acquisition of video in particular. The final part of the exhibition includes large-scale photo-based installations by American artist Susan Hiller and Chinese artist Xu Zhen as well as videos by Chinese artists Qiu Anxiong and Cao Fei, as well as Chen Chieh-jen from Taipeii, Navin Rawanchaikul from Thailand, Adrian Paci from Albania and Oscar Muñoz from Colombia. Their work addresses political concerns pertinent to their own experiences, but relevant across the world, issues of rapid industrialization, migration, memories of painful pasts and hopes for brighter futures.